Tehran Sep 16 (IANS) Iran would increase uranium enrichment if the European Union (EU) fails to implement its obligations following the US withdrawal from the Iranian landmark nuclear deal Iranian Foreign Minister Mohammad Javad Zarif said on Saturday. "The Europeans and the other signatories must act in order to compensate for the effects of the US sanctions " Zarif was quoted as saying by Press TV. He downplayed the possibility of Iran s withdrawal from the nuclear deal but cautioned the EU partners that Iran might act if they fail to secure Iran s interests in the deal. "Oil and banks" are the "litmus test " he said alluding to the EU pledges to help Tehran in the face of US re-imposition of sanctions on Iran s oil exports and banking transactions. 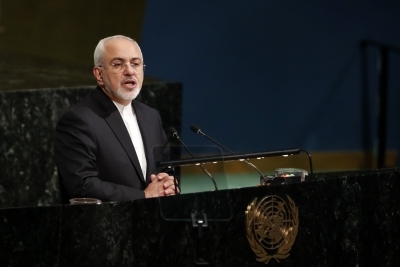 European parties need to decide whether being ready to follow their words Zarif said adding that "they should also decide if they want to submit to US pressure." Iran and six world powers namely Russia Britain China France the United States and Germany struck a landmark agreement over Iran s nuclear programme in 2015 formally known as the Joint Comprehensive Plan of Action (JCPOA). However US President Donald Trump decided to withdraw Washington from the deal on May 8 and re-impose sanctions including oil embargo on Iran. Iran has held several rounds of talks with France Britain and Germany to revive the blocking statute a 1996 regulation that prohibits EU companies and courts from complying with foreign sanctions laws. Iran has incessantly urged Europe to take "practical and tangible measures" to protect Iranian interests since the US pullout.